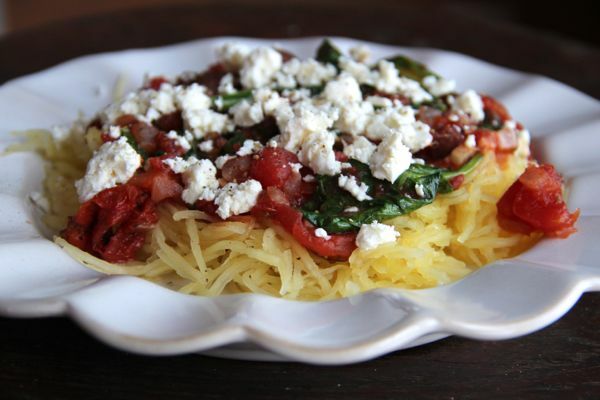 Noodle like strands of roasted spaghetti squash are tossed with a Mediterranean inspired sauce dish that tastes like a hearty pasta dish minus the calories. After reading The China Study book, I was more inspired than ever to incorporate plant-based meals in our weekly menu. This recipe results in a hearty meal with plenty of flavor. 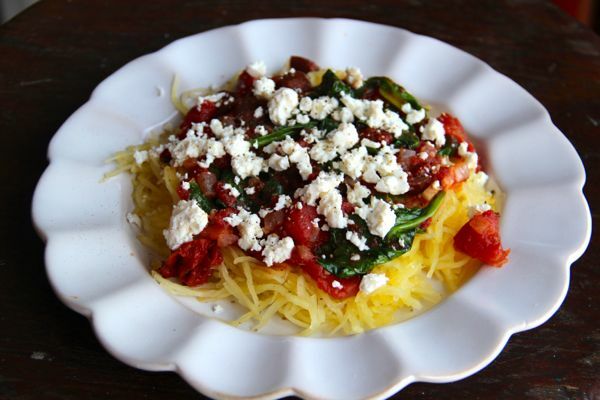 If you have not cooked with spaghetti squash, you really must give it a try! Its long noodle-like flesh makes it a perfect substitute for pasta and its mild flavor makes it incredibly versatile to cook with as it absorbs the flavor of the sauce it is paired with. 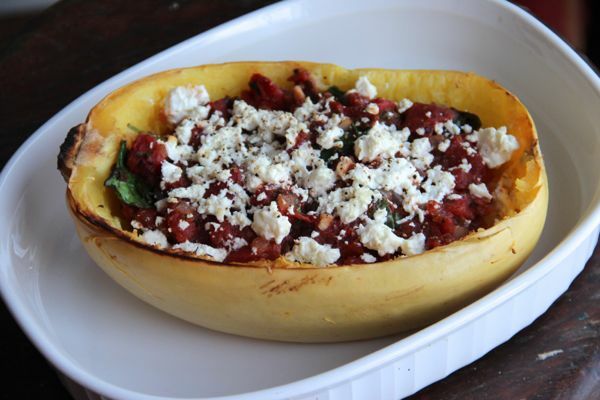 Low in calories and carbohydrates, spaghetti squash is a great source of fiber and loaded with key vitamins and antioxidants. Lightly spray a baking sheet with olive oil cooking spray. Using a large sharp knife, cut the spaghetti in half lengthwise and remove the seeds and pulpy fibers (usually a darker color). Tip: An ice cream scoop works great for this step. Place the squash with cut sides down on the baking sheet and bake for 45 minutes to 1 hour, until a fork easily pierces skin. While the squash is cooking, heat the olive oil in a large skillet over medium heat. Add the onion and cook until tender, stirring often. Add the garlic and continue cooking until the garlic is fragrant, about 45 seconds. 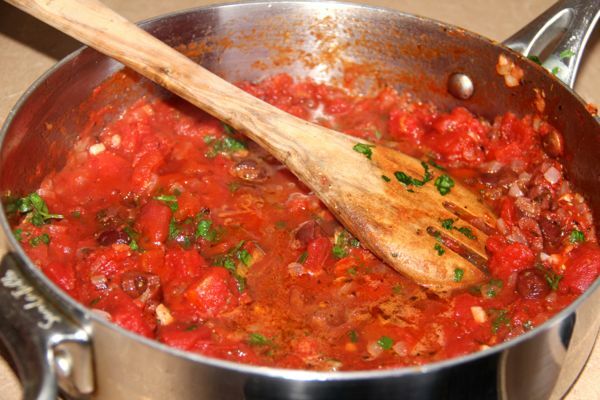 Add the tomatoes, olives, parsley, oregano and salt and pepper and turn heat to low. Simmer on the stove for 5-10 minutes, keeping the heat on low. Add the spinach the last few minutes and stir. The sauce is ready once the leaves are wilted in the sauce. Remove the squash from the oven and set-aside until cool enough to handle. Turn the squash over and use a large fork to shred the flesh into spaghetti like strands. Place the “noodles” in a serving dish, add the sauce and gently toss. Sprinkle with feta cheese and serve warm. 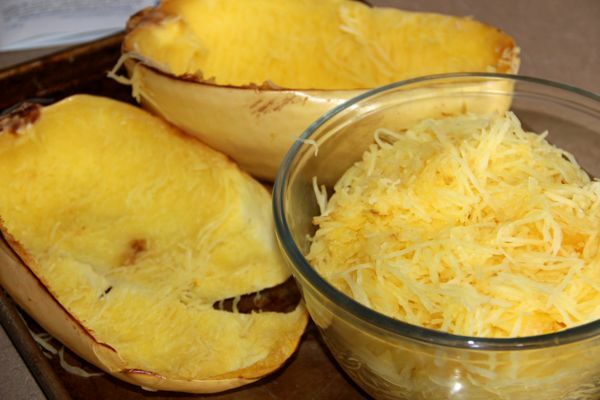 Alternatively, place the squash strands back in the squash shells, add sauce to each and sprinkle with cheese – place in the oven under the broiler just until the cheese begins to melt.